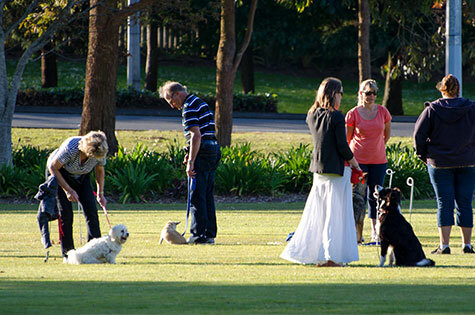 Hamilton Dog Obedience Club is all about helping you to understand and enjoy your dog even more. When you take obedience classes, you’ll learn much more than sits, downs, and stays – you’ll learn how to be a confident and decisive leader. And when you can confidently tell your dog what you want, the more your dog will trust you, which will give you more control over him or her. At HDOC we use training methods based on positive reinforcement – that is, we reward good behaviour, rather than punishing the bad. Usually that’s done with food rewards, but we also use play, verbal praise, and patting, depending on what motivates your individual dog best! Above all, we want you and your dog to have a positive experience at the Club. All our instructors are volunteers who are here to help make that happen for you both. If you haven’t done obedience with your dog before, you’ll start in CD1 or Puppies. The course is the same for both, but CD1 is for dogs older than six months – this is so we don’t overwhelm little puppies with big boisterous dogs in their class! After you’ve been through Puppies or CD1, you’ll go into CD2. We use this video to progress dogs and handlers through teaching loose lead walking. This is one of the hardest exercises to master, but it’s also one of the most important and useful! It shows how to take it slowly in a distraction-free environment, allowing the dog to learn that being with you is the most rewarding, and gradually progressing step-by-step from there. You’ll find it really helpful to have a good look through this video two or three times – and even give the techniques a go! – before you start your classes.